Bharatha and Satrughna went straight to the place where the Ministers, the Royal Preceptor, and the leading citizens of the Capital had assembled. All of them were awaiting their arrival, anxious to know what they had resolved upon, and silently expectant to listen attentively to what they were about to tell them. Meanwhile, Bharatha fell at the feet of the Preceptor and declared, "Divine Master! I am telling you my honest intention; please believe my sincerity, for, I am not hiding anything. I am opening my heart without any reservations. The effect is harder than the cause; the metal that is extracted from the soil is harder than the soil, you know. Born in the womb of the hard-hearted Kaikeyi, I am indeed even more hard hearted. Or else, how can you explain that I am still alive, despite the fact that Rama is far away from me? Kaikeyi has transferred Sita and Lakshmana into the forest, she has sent her husband into heaven, plunged the subjects of this vast Empire in sorrow and anxiety, and brought eternal infamy on her son. And, you are now demanding that I should rule over the Empire and cover myself with lasting disgrace. I am not in the least happy over this; I do not deserve this at all. Will not people laugh at me in scorn if I sit on the Lion Throne as Lord Ruler when Rama is moving about in the jungle? "My reign will bring only harm to the people; for, my accession itself will be immoral and unrighteous. And, who will deign to honour an usurper and obey his commands? I cannot punish the unrighteous and the immoral! With what face can I correct wrong doers, when I myself have done mountains of wrong in ascending the throne that is not rightfully mine? People would certainly point the accusing finger at me, when opportunity arises, though they may keep quiet for some time, for fear of the reprisals that I might inflict using my authority. "The evil design of my mother has now become transformed into an agonizing headache for me. I cannot wait even a single moment here, without seeing Sita and Rama. I am only communicating to you my terrible anguish; only the sight of Rama can cool my heart and cure my agony. No words of consolation or explanation can bring me solace in my grievous plight. I have obtained permission from Kausalya and Sumitra. I have decided to proceed at dawn tomorrow to the place where Rama is at present. My sins, however plentiful they might be, will be reduced to ashes the moment the eyes of Rama fall on me. Even if Rama does not speak to me, I shall be happy taking his Darsan always, hiding behind some tree, and following him at a distance, delighted at the chance. Elders who have gathered here! Pray for me, bless me that I may progress as a result of the darsan of Rama. Minister! Give me permission to go to the presence of Rama. I am the slave of the Lord Rama. He is the Lord for all of us." No one in that assembly, among the Ministers, the Feudatories, and the leaders of the people could raise his voice in reply. They realized the depth of Bharatha's remorse. They understood that Bharatha had an unsullied heart and that he was refusing to be bound by the coils of the conspiracy his mother wound round him. The chief of the Elders of the City rose from his seat, and said, "Lord! We too shall come with you. We too find separation from Rama an insufferable agony. We do not care what happens to our lives after we get one chance to have his Darsan." He asked for this permission on behalf of every one gathered there. Others too responded to the suggestion wholeheartedly and came forward with prayers that they too be taken to Rama. Within minutes, the news spread into every nook and corner of the vast City and men, women, children, young and old, got ready to start! Who can dissuade whom? There was no one that day among the huge population of Ayodhya so cruel as to prevent others from proceeding to Rama for his Darsan. The mothers, Kausalya and Sumitra, too set out on the journey with their maids. Meanwhile, Kaikeyi, overcome with repentance for her errors and her sins, communicated with Kausalya and prayed that she too might be allowed to accompany the queens. She pleaded that she might be permitted to pray for pardon, and join the others In their attempts to persuade Rama to return to Ayodhya. Kausalya who had a pure unblemished heart, did not entertain the least doubt or deviation from right-consciousness; she sent word that Kaikeyi could certainly join her. Bharatha was informed that the entire City was on the move. He informed the Ministers that at least a few had to stay behind, in order to guard the City, without leaving it helpless. So, some were left behind. Vehicles were made ready before every house during the night itself, so that the inmates might join the trek, during the early hours. Practically everything on wheels was commandeered for the purpose. Food and drink for the entire mass of people were duly arranged. Like Chakravaka birds, the men and women of Ayodhya awaited the heralding of the dawn, so that they might journey towards their dearly beloved Lord. It was a night of ecstatic anticipation for the citizens; they spent it in contemplating on the Darsan that awaited them. The army with the entire force of chariotry, elephantry, cavalry and infantry got ready to march. Vedic scholars were directed by the Minister that they had to keep on reciting the auspicious hymns; they had also to take with them the ceremonial requisites for the ritual worship of Fire. Right on time, according to the calculations of the astrologers, the leading chariot for Bharatha and Satrughna, and the palanquin next in order for Queen Kausalya were brought before the palace. Bharatha ordered that every one must occupy the chariot or vehicle allotted. And allowing his chariot to move on with no one in, Bharatha and Satrughna walked on, by its side, barefooted. People thought that they might walk in that manner only for some little time, for some short distance. But, they found that Bharatha was in no mood to get into the chariot; however long the distance to be covered. Kausalya could not tolerate this; she said, "Son! I cannot suffer the sight of your walking. Sit in the chariot at least for some time." At this, Bharatha replied, "Mother! This is only to make amends for the sins I am burdened with. Do I suffer now while walking on the road at least a fraction of what Rama and Sita are suffering in the forest, while they walk barefoot? When they are walking barefoot, it is highly wrong for me, their servant to ride in a chariot. Pardon me for disobeying your command; permit me to walk as I am doing now." Meanwhile, the Royal Preceptor, Vasishta, and his consort Arundathi, who were seated in the preceding chariot, stopped their vehicle and witnessing the determination of Bharatha, they prayed to Bharatha at least to sit in their chariot and act as their charioteer. But, Bharatha was adamant. He said, "I am the servant of Rama and I am bound only to his chariot. Until I get the precious chance to act as his charioteer, I shall not ride in any chariot nor hold the reins of any other steed. This is my vow." Vasishta desisted from any further persuasion; he was genuinely delighted at the love and reverence that Bharatha bore towards Rama. They reached the bank of the River Thamasa at nightfall on the first day. The next day, they reached the bank of the Gomathi. The Thamasa is a tributary of the Gogra River, while the Gomathi is a tributary of the Ganga. As soon as it was dark, the vehicles were stopped, shelters were provided for women, children and the aged; the Minister ordered the soldiers to distribute food to the people, systematically and with due respect. Really, throughout the journey, everyone carried out the work assigned to each with care and enthusiasm. They took good care that no one suffered any hardship. Resuming their journey with the dawn of the third day, they reached Sringiverapuram when darkness fell on the land. The king of the Nishadas saw the huge concourse and the army on the march; he was perturbed, for, he wondered why Bharatha was proceeding to the forest and why he was taking with him the army with all its components. What was the significance of it all? He tried to solve the mystery. He discussed within himself the pros and cons of this unusual procedure. He argued within himself: "When the tree is poisonous, its fruit too is bound to be poisonous." He tried his best to foil the plans of Bharatha; he directed his men to keep every boat sunk in the depths of the Ganga, and to deprive the prince of all means of crossing the river. He ordered that they should prevent the concourse from crossing over to the other bank, even at the cost of their lives. And, the King of the Nishadas stood ready with his bow and arrow, set to attack, willing to sacrifice his life in the cause of his beloved Rama, in spite of the fact that the forces which Bharatha was leading were far superior in strength to his own. Guha alerted his community and all its members to be prepared for the imminent battle. Then, he got ready to meet Bharatha in order to discover whether he had come as foe, or as friend, or whether he was neutral, only a passing visitor who need not be worried about. Knowing that Bharatha was a Prince of Imperial Lineage, he secured as offering to be presented to him large quantities of flowers, fish, flesh and fruits. He planned to discover the innate intent of Bharatha by noting his reactions to the various articles that were offered to him. Roots and tubers and fruits are Sathwic food; if he preferred them, he must be reckoned a friend. The flesh of slain animals is Rajasic food; preference for that type of food would mark out the "middle of the road" neutral, who is neither ally nor adversary. Fish, if accepted eagerly, would Indicate a foe, for they are Thamasic Items of food. Taking with him these offerings, Guha, the Chieftain of the Nishadas, proceeded to the presence of Bharatha. Good omens greeted him at the very first step. His eyes fell on the Sage Vasishta. He ran forward and fell at his feet, announcing himself by name. The Preceptor recognized him as the companion of Rama; he blessed the Chieftain, and calling Bharatha to his side, he spoke to him of Guha as the 'friend' of Rama. As soon as those words fell on his ears, Bharatha embraced Guha warmly, and showered questions on him about his health and welfare. Bharatha prompted Guha to relate to him how he met Rama. When Guha mentioned how Rama spent one whole night with him on the banks of the self-same river, Bharatha showed great earnestness to listen to his description of that night; his eyes and ears were panting with thirst for the nectar of that narrative. The chieftain of the Nishadas was all praise and adoration for Rama; he showed him the thatched hut he had prepared so that Rama, Sita and Lakshmana could rest for a while; he told him of the conversation he had with Lakshmana during the night. On hearing all this, Bharatha and Satrughna could not stop the stream of tears flowing down their cheeks; they could not suppress the surging waves of sorrow. Watching them, Guha was convinced that they had genuine brotherly feelings towards Rama and that there was no trace of hostility in them. He was struck by their devotion and the sincerity of their dedication. Bharatha had a close look at the huts constructed for the use of Sita, Rama and Lakshmana; he desired that they be tended with due care so that they suffer no damage. Following the orders of the Preceptor, Bharatha performed the ceremonial bath in the holy river Ganga, along with his mothers. Bharatha asked Guha to take them to the place where Rama spent the night; pointing his finger to a heap of darbha grass that had been scattered by the wind, Guha said, "Sita and Rama rested here, on this bed of dry grass that night". Bharatha and Satrughna prostrated before that holy spot. Bharatha lamented, "Alas! My Lord accustomed to sleep on a thick soft silken bed, how could he sleep on such hard stuff? Alas! How did that holy mother Sita bear all this hardship?" Overcome with grief, Bharatha could not move from the place for a long while. Rising, Bharatha requested that he be shown the places which Rama, Sita and Lakshmana had rendered holy by treading on them. Guha took them to an Asoka tree, under whose shade they sat for some time to eat a frugal meal of fruits. There too the brothers fell on the ground reverentially, knowing it to be holy ground. While they were moving round the places sanctified by Rama, Sita and Lakshmana, the two brothers suffered indescribable agony. The humility, reverence, and devotion they manifested touched the heart of the Nishada chieftain. Bharatha could not contain his anguish when he contemplated the discomforts that Sita - Goddess Mahalakshmi Herself - the dearly beloved daughter of Emperor Janaka, the daughter-in-law of Emperor Dasaratha, and the Consort of Rama the Mighty, was enduring. Bharatha disclosed to Guha that the inhabitants of Ayodhya City could not survive in that City any longer, for the holy couple Rama and Sita, had left it; they felt that Ayodhya had been transformed into a jungle, for it had no Rama in it; he said that he too could not bear their grief, and he too realized that Ayodhya was wherever Rama was; so, he explained, he had come with his following and with the inhabitants, to the sacred Presence of Rama. Guha grasped the situation clearly now and gave up all the suspicions he had entertained, when he saw Bharatha advancing with his army, with its four components of infantry, cavalry, elephantry and chariotry, towards the jungle where Rama was. He opened his heart to Bharatha and begged to be pardoned for the doubts he had framed in his mind about his intentions. Bharatha said that his fears were natural and that he had committed no wrong. For, the truth was, he was indeed a wicked barbarian! "I am the reason for the exile that Rama is going through", he said. "For that one crime, I deserve to be killed; he who kills me commits no sin", he groaned. When Bharatha was condemning himself so harshly, Guha poured out his prayers for pardon. News spread in Sringiverapura, the Nishada Capital, that Bharatha had come to the bank of the Ganga. At this, the subjects of Guha hurried groups to honour the brother of Rama. They fed their eyes on the beauty and majesty of the brothers; they praised them to their hearts' content; they prostrated reverentially before them. They also roundly reprimanded Queen Kaikeyi. They blamed the God of Destiny, Brahma, for being so cruel. They shed profuse tears; they extolled Rama through manifold forms of praise. They prayed to Bharatha and Satrughna (every one of them, men, women, children, all) to bring Rama, Sita and Lakshmana back with them. Bharatha was struck dumb at this demonstration of extreme agony at separation from Rama! Tears rolled down his face. "Prayer is my task; what happens to the prayer is dependent on the Grace of Rama. I am but a slave; who am I to exert pressure on Rama? Join with me in my prayer; pray from the depths of your hearts that Rama should return to Ayodhya. His heart will certainly melt at our agony. This is our duty. Let your prayers help my prayers to succeed. Rama has come to save the world, and he will not refuse the prayers of the people." Bharatha consoled and comforted the Nishadas and others in ways best suited to their needs and capacities. Meanwhile, darkness fell on the earth, and Bharatha asked the Chieftain of the Nishadas, to direct his people to go home. They ate the fruits brought by Guha and spent the whole night talking about Rama and His glory. When the eastern sky brightened to usher in the new day, Bharatha instructed the Minister to awaken the populace; he bathed in the sacred Ganga, with his brother; the Mothers too finished their bath. Every one got ready to continue the journey. Guha the Chieftain of the Nishada tribe, collected enough craft to row over the large mass of people, the chariots, the horses, and other sections of the armed forces that had accompanied Bharatha. The task of ferrying them across the Ganga was quickly and successfully accomplished. After ascertaining whether all had been transported across, Guha moved forward into the jungle, showing Bharatha the way. The Brahmins, and the Preceptor Vasishta walked on as one group; the people of Ayodhya followed in one vast mass; units of the army followed behind; journeying thus, Bharatha reached the confluence of the rivers Ganga and Yamuna, the sacred Prayag, in the afternoon. Bharatha had never walked so much on foot, and so, his soles became sore and they hurt with a burning sensation. Yet, he plodded on, for, he felt his pain as recompense for the pain inflicted on Rama. He ignored it, for he was conscious only of the pain Rama was undergoing at that very moment. Prayag is known as Triveni, for the river Saraswathi too enters the twin rivers at that holy place. Its sacredness is tripled thereby. They bathed at the famous confluence with due rites. The anchorites, hermits, celibates, sages, and monks of Prayag were delighted at the chance to fill their eyes with the sight of Bharatha. They told among themselves, "O! he casts around him the same halo as Rama; in fact, the appearance is just the same." Every one who looked at him could scarce indulge in a wink, lest the delight would be interrupted thereby! The inmates of the Bharadwaj Ashram in Prayag learnt of the coming of the brothers with contingents of his armed forces, accompanied by their mothers, and ministers. Sage Bharadwaja sent his disciples to Bharatha and invited the party to visit the Ashram. Interpreting the invitation as a command, Bharatha and his entourage entered the Ashram. The brothers prostrated before that Monarch of the Monastic Orders. Bharadwaja raised them by the shoulder and drew them near with great affection. He gave them refreshingly cool drinks. He noticed that Bharatha was sitting with his head bent in shame and fear, lest his share in the exile of Rama be revealed through questions that might be asked. Bharadwaja discovered the reason for his silence and nervousness. He said, "Bharatha! You need have no apprehensions; I am aware of all that happened. No one can control or direct the path of Destiny. Why pine over the boons that your mother demanded? No trace of wrong can be attributed to her for this. The Will of God induced her to ask such boons. Kaikeyi, I know, loves Rama as her very breath; so, the reason for the turn her mind took is to be sought, not in any human field of thought and reason, but, only in the Divine plan. As the world judges events, Kaikeyi has done wrong; as the Vedas lay down, the Goddess Saraswathi who presides over the tongue has done wrong; know that what has happened is in conformity with the will of the Almighty. "Bharatha! The world will enthuse over your spotless renown, and sing your praise. Vedas will be valued more on account of such as you, exemplifying their teachings and demonstrating their efficacy. Do not hesitate! The son to whom the father entrusts the kingdom is thereby deemed deserving of the right to govern it. That relentless adherent of Truth, that High-Souled ruler Emperor Dasaratha gave the Empire to you, and ordered that you should act according to the Dharma of Monarchs. "The exile of Rama into the forest has resulted in a series of calamities. The entire world is sunk in sorrow on account of this event. Now your mother is repenting pitiably over the wrong; you are innocent and blameless. No blemish can attach itself to you now if you rule over the Empire. In fact, Rama will be happy to know that you have taken up the reins of imperium. "I must also say that the mission on which you are now set is very laudable indeed. Your purpose is highly commendable. For, devotion to the Lotus Feet of Rama is the spring and source of all prosperity and progress. Bharatha! I can boldly declare that there is none so virtuous, so fortunate as you. You have proved yourself worthy of being the dearly beloved younger brother of Rama, Rama sanctified this, our Ashram, while on his way to the forest. That night, till the hour of midnight, Rama was talking to me mostly of you and your virtues. They proceeded with me to Prayag for the holy bath; they remembered you even while engaged in bathing! He felt very sad that he could not see you and Satrughna the day he left Ayodhya. I can not measure the love that Rama has towards you. "Besides, Rama is ever intent on assuaging the grief of those who take refuge in him. The entire world is his family; all are his kith and kin. I believe you are the 'affection' of Rama, in human form, no less. What you feel as a blemish on your name is, to me a lesson, an example, and an inspiration. Bharatha! You should not be weighed down by sadness. You are in possession of the Wish-fulfilling Gem! Why then should you lament that you are poor? It isn't proper that you should do so. The Darsan of Sita, Rama and Lakshmana is verily the treasure all spiritual aspirants seek. I secured that fortune; for, I feasted my eyes on that Darsan. I could speak with them; I was in their Presence and I could touch them too. I had the privilege and pleasure of being their host. Perhaps, there was some balance of fortune still awaiting me; for, I have now this pleasure of getting your Darsan too. Ecstasy has now filled my heart. I am truly blessed. Rama has exiled himself into the forest for our sake, ascetics living therein, so that our yearnings might be fulfilled and our holiness heightened. We are blessed indeed." 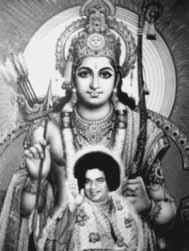 In this manner, Bharadwaja, the great Sage, praised Bharatha for his manifold virtues and excellences. While speaking in this strain, tears of joy rolled down the cheeks of the revered ascetic. Bharatha and Satrughna had their minds set on Rama and his limitless Prema; they felt that they were indeed fortunate to be his brothers, but the joy was immediately extinguished at the thought that they had been themselves exiled from the presence of that Embodiment of love. So, they were plunged in gloom, in unbearable agony and inexpressible grief. In a voice choked by anguish, Bharatha said, rising up from the prostration he offered to the Sage, "Master! You are aware of the Past, Present and the Future. You have spoken the very Truth. You are master of the Highest Truth. Rama is unbeatable in skill and power. I have resolved to utter in your Presence only the Truth. Rama knows the workings of the people's mind and what is now agitating them. I have at present no grief over the wrong committed by my mother. I have no fear that the people would blame me for the tragedy that has befallen them. I have no despair even when it is announced that I am ineligible for heaven. "My father has earned high renown; though dead, his fame has spread over the entire world. When his beloved son, Rama departed from his presence with Lakshmana, he gave up the bubble breath that very instant. He could not survive the bolt of that tragedy. There is no need, therefore, to be anxious any more about him. But, Sita, Rama and Lakshmana are moving about bare-footed. Donning the robes of ascetics, they sit on mats of kusa grass; they reside in leaf-thatched huts; they are fried by the sun, soaked by rain; they shiver in the cold and bear its pangs; they are undergoing untold hardships in the forest, aren't they? Now, tell me, am I not the sole cause for all these hard ships? It is this sad fact that is eating me throughout all the hours of the day and night. Food refuses to enter my stomach; sleep refuses to close the lids of my eyes. This crookedness of my mother's mind has become a dagger sticking in my heart. The stratagem she devised for my installation on the throne has turned into a trap to ruin me. The agony that is gnawing me from within cannot be appeased, whatever is done. Nothing can cure it. It will end only on the day when Rama returns to Ayodhya. No other remedy exists to destroy this agony."